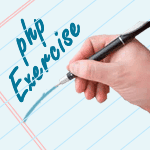 Write a PHP class that calculates the factorial of an integer. Previous: Write a simple PHP class which displays an introductory message like "Hello All, I am Scott", where "Scott" is an argument value of the method within the class. Next: Write a PHP class that sorts an ordered integer array with the help of sort() function.